Line fishing is a technique that is widely used for both recreational and professional fishing. When compared with the other more violent methods, it seems the one that is most fair. A one on one situation between a fisherman and a fish. There are a number of varieties of line fishing which include deep sea, shore, trout and fly fishing to name only a few. Fishing provides a rush that no other sport can provide. As a beginner fisherman, the basic equipment is required to get you started. A rod, reel, line, hooks and bobbers. There isn’t any need to rush out and purchase the most expensive on the market. As your skill levels increase and you gain more experience, you may find yourself leaning towards one variety of fishing over another. It is at this point that you can begin to make selective choices regarding the equipment you require. The term line fishing encompasses many different techniques. 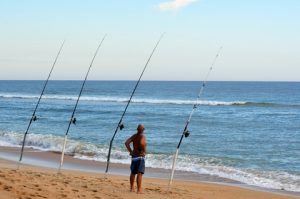 For recreational fishing, a line and hook is the most common choice. This kind of fishing is referred to as angling. The aim of the game is to entice the fish to bite into the hook using bait. Trolling is the technique used to catch larger game fish. Lines are dragged along in the water from a moving vessel. This freshwater fishing technique makes use of a lure to attract the attention of the fish. Long line or trotline fishing is often used by commercial fisherman. The technique encompasses the use of line with multiple, baited hooks at the end. Snagging is an illegal technique that seeks to hook the fish through the body rather than tempt it to bite at the hook. Treble hooks are used in this method. Fishing is a rewarding hobby both recreationally and professionally. There is nothing like a fight to the finish.